claims a muzzle velocity of 4080 ft/sec for the .30-06; 3800 ft/s in .308 and 3400 ft/s in .30-30. This ammunition will not function in most semiautomatic rifles. A special fast-burning powder is used in this ammunition. On firing, the rifling of the barrel engages the sabot. 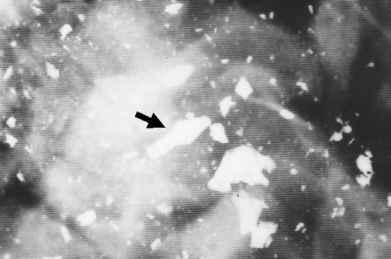 As it exits, the centrifugal force and increased air resistance spread the "petals" of the sabot, causing it to drop away from the bullet (Figure 10.9). 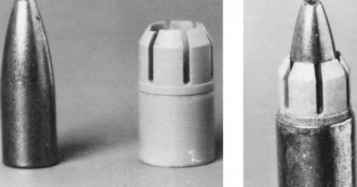 The manufacturer claims complete separation of the plastic sabot from the bullet within 14 in. of the muzzle.